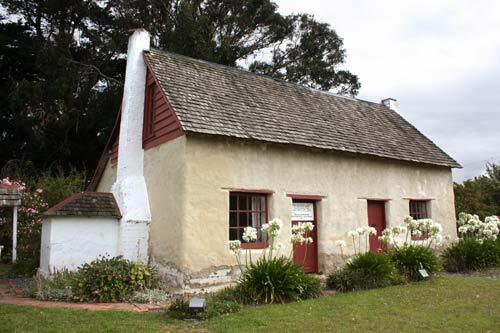 Cob (a mixture of clay, grass and tussock) was a common building material in early 19th-century Marlborough south of the Wairau River, partly because of a lack of readily accessible timber. This cottage was built on the Riverlands run between 1854 and 1868. It has served variously as a farm cottage, shearers’ quarters, school, and a store room and hay shed. Restoration to something like its original state started in 1960, and the building was opened to the public by the Marlborough Historical Society.